I got this recipe from the Masterchef Australia website, instead of using pork I used chicken breast. I have to admit that I didn’t make the coleslaw but I did make the chips. I made sandwiches with the left over bread. It was so filling I ate half for lunch & half for dinner. DELICIOUS!!! 1. Place potatoes in a saucepan with cold water, bring to the boil over high heat, cook for 10 minutes or until just tender. 2. Using a mandolin, slice the carrot into thin slices. Chop the carrot thins into fine matchsticks. Place carrot with cabbage and red onion in a bowl. 3. Process 1 egg, mustard and vinegar together in a small food processor until creamy. With motor still running, gradually add oil in a steady stream until thick and creamy, season to taste. 4. Add 2 tbsp of mayonnaise to the cabbage mixture and toss well to combine. Set aside. (Cover remaining mayonnaise and refrigerate). 5. Meanwhile, pound steaks with a meat mallet until each steak is 5mm thick. Season with salt and pepper. 6. Place sourdough in a food processor, pulse to form coarse crumbs. Place the crumbs, herbs and the parmesan in a bowl, mix well to combine. 7. Place flour, salt and pepper onto a plate and the remaining egg, whisked into a shallow dish. Dip pork, 1 piece at a time, into the flour. Shake off excess. Dip into egg then coat with breadcrumb mixture, pressing crumbs on firmly with your fingertips. 8. Pour oil into a saucepan until one-third full. Heat over medium-high heat until 130 degrees celsius in temperature. Deep-fry chips for 3 minutes. Remove and drain. Increase heat to 180 degrees celsius, return chips to the pan, and cook for a further 7-10 minutes or until golden. Drain and keep warm. 9. Heat oil and butter in a large frying pan over medium heat. Cook pork, in 2 batches, for about 2 minutes each side or until browned and just cooked. Drain. 10. 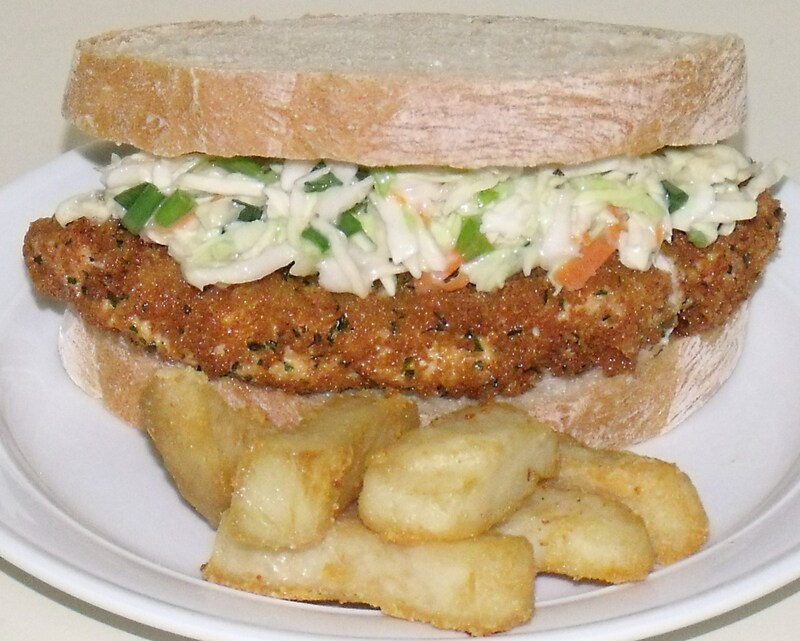 To serve, divide the chips, schnitzel and coleslaw between plates.